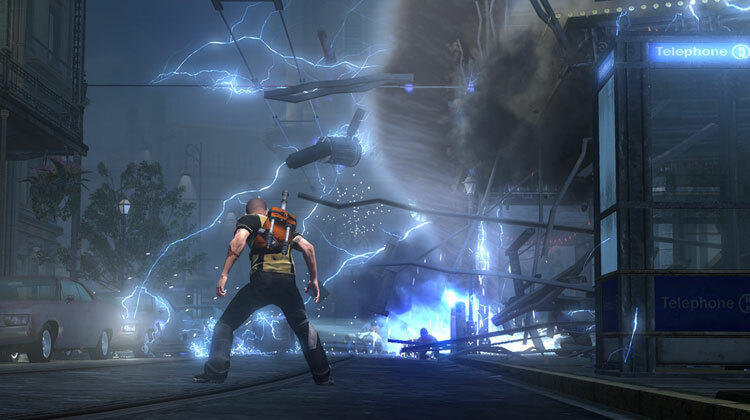 InFamous 2 challenges you at every turn to just give up and embrace the dark side. With the array of lightning-focused powers available to protagonist hero/anti-hero Cole McGrath and the scale of destruction they are capable of creating in the New Orleans-inspired city of New Marais, it would be much easier to simply let loose with everything you’ve got on the bad guys and worry about the collateral damage… never. The gameplay tests your interest in doing the right thing vs. the wrong one much more effectively — and more frequently — than the plot ever does. The public responds accordingly too, adoring your heroic efforts to keep them safe or cowering back in fear as the so-called Demon of Empire City whizzes by on a lightning tether toward the next scene of devastation he intends to create. 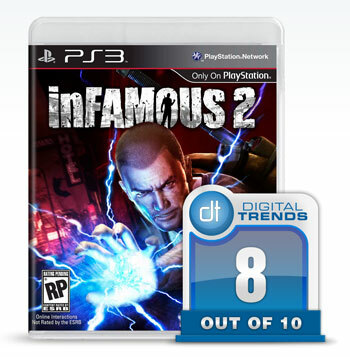 As inconsequential as the story in inFamous 2 turns out to be, it’s not horribly written by any stretch. The newly awakened Conduits — super-powered humans — from the previous game are growing in number, though it’s the all-powerful Beast referenced at the end of the first game that is Cole’s cause for concern in this sequel. Lacking the power to bring down the great being, which looks very much like a giant, ashy Dr. Manhattan (minus the CG dong), Cole and his pal Zeke hightail it down to the city of New Marais to prepare for battle. Cole needs to get stronger, and he knows what needs to be done to get there: collect a series of Blast Cores which, in addition to granting him new abilities, also promise to eventually give him enough raw power to spool up a device that should put a stop to the threat once and for all. Cole encounters a number of other Conduits on his journey, but there are two in particular that he teams up with, each operating at opposite ends of the morality spectrum. On the side of all that is good and blue-colored you’ve got NSA agent Lucy Kuo. On the other side is Nix, representing chaos, disorder and the color red. Doing certain missions during the game for one will cancel out those available for the other and certain moments in the story flat-out force players to choose a course of action suggested by one or the other. The impact of this is largely cosmetic, determining how some of your bonus powers develop and how each character responds to you. The game’s conclusion is pretty much fixed, with you simply choosing which side you’re going to fight for. You can also start the game with the data and karma choices you made in the original inFamous if you have any, which could sway your decision. The saving grace here is the in-the-moment writing, which runs the gamut between average and excellent, only rarely dipping down into sub-par territory. The relationship between Cole and Zeke is the game’s best, and in some ways stands as a gold standard for character development in the interactive space. There are a number of scenes scattered throughout the game, mostly toward the end as circumstances become more dire, that feel very real and human. One scene in particular featuring our starring duo, an old cowboy flick and a comfortable silence could describe any number of occasions I’ve shared with my own close dude friends… minus the whole “lightning exploding out of my body” thing. If you enjoyed the raw gameplay of the original inFamous, know that things have only improved here. Cole is a much more agile and capable climber; the animations aren’t nearly as smooth as what you see in the Assassin’s Creed series, but McGrath moves just as quickly as Altair/Ezio, if not quicker. The landing auto-correction is extremely generous, too much so at times, such as when you’re repeatedly stopped from dropping into a narrow space because Cole keeps automatically grabbing nearby ledges. 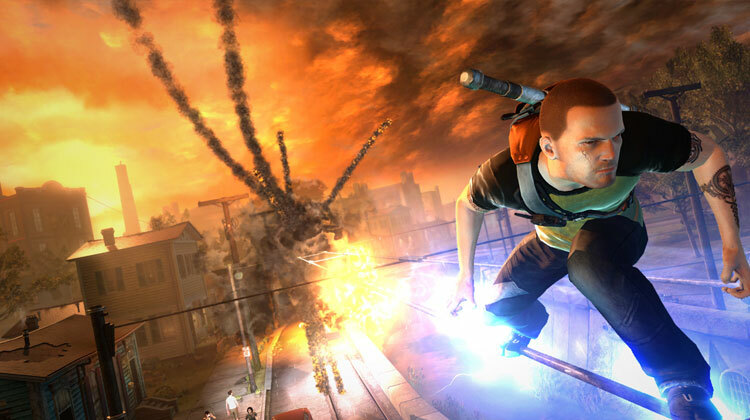 Overall though, the game’s parkour elements are improved on over the original inFamous. The same goes for Cole’s range of powers, especially since the game starts off with everything you worked to unlock in the first outing already available and ready to go. You only open up more as you proceed, spending earned experience points on powers that are unlocked by completing challenges, reaching certain story milestones or rising up or down through the different morality levels. As you progress, moving around the city grows from being simple fun to its very own, little minigame as you segue seamlessly between grinding power lines, boosting a few extra feet using your Static Thrusters and grappling from one rooftop to the next with your handy Lightning Tether. This is where inFamous 2 is at its best, with Cole’s breathless traversal across New Marais rooftops. It is unfortunate then that his destinations tend toward the boring and mundane. The story missions in inFamous 2 are reasonably varied most of the time, but the secondary missions are an exercise in repetition. Pulling from a handful of stock mission types, the yellow objective markers scattered around the map offer an opportunity to perform a simple task in exchange for freeing a small portion of the city from gang controls. Completists will of course want to play every one, and they’ll quickly realize that there’s a very simple formula at work here. What’s really shameful for Sucker Punch is the way the game’s built-in user-generated content (UGC) tools expose the simplicity of these secondary objectives. You can literally re-create any one of them with minimal effort by loading up a template… or you can spend some time improving on the base template with additional objectives, fun (text only) story riffs and other bits and pieces. Why more time couldn’t be spent during development on making the core secondary objectives more interesting is a total mystery. The stock secondary missions may be a waste of time, but the UGC element in inFamous 2 offers a near-infinite range of possibilities for expansion and continued play. You can set filters in the game’s menu which determine how much you see on your in-game map. At the top level you can choose between attributes like “Newest” or “Most Famous,” but you can drill down for much more detail than that. Say you want to only play with UGC missions that deliver some sort of pop culture homage. Just set the type of mission you’d like to play to “Homage” and you’re set. The quality varies of course — you’re asked to rate each mission after playing it — and there’s obviously no voice work, but even in the game’s early days of life there are already quite a few entertaining missions that offer a taste of something different. Add to that the fact that you earn actual experience points in your main game for playing these and it’s a no-brainer. On the creation side, prepare for a very steep learning curve. Documentation is available online, but learning to think in game development terms only comes with time. Modders will feel right at home and bravo to Sucker Punch for offering such a full-featured suite of tools for them to play with. It’s not a knock against inFamous 2 to say that the UGC creation tools are very complicated, but it’s a fact that aspiring mission creators are going to have to deal with. Remember though: as hard as it might be to use, when someone goes in and knows what they’re doing, the results can be magical. 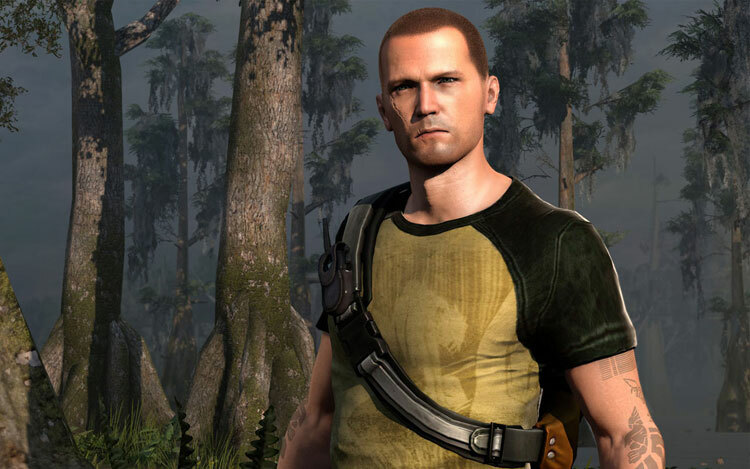 Sucker Punch didn’t knock inFamous 2 out of the park, but it may well end up feeling that way if the online community really embraces the game’s UGC features. That kind of flexibility is a first for open world games, and it is implemented quite well. It also helps that the underlying mechanics of moving around and frying enemies feel so right. The story may stumble here or there and the stock set of secondary missions is offensively tedious, but overall this is a game that helps you remember why the PlayStation 3 is such a beast of a gaming console.